Nuheara IQbuds work like regular wireless earbuds, but add "augmented hearing" to the mix so you can focus on a conversation. Sure, AirPods let you listen to music, take phone calls and tap into Siri, but they represent a missed opportunity because they don’t solve a crucial problem faced by many people in the modern world: hearing what’s going on around them. As you might have guessed, Cannington’s company tackled this problem with a new product that launched at CES this week. Nuheara’s IQbuds are smart, truly wireless earbuds that do more than just make calls and deliver high-fidelity audio to your ears. They make it possible to carry on conversations in noisy environments like restaurants, bars and even massive Las Vegas trade shows. Cannington, gregarious Australian who’s worked in audio for years, is clearly excited about the possibilities presented by the new era of wireless headphones that’s dawning. Nuheara’s $299 smart earbuds come at a time when “hearables” are poised to grab the world by the ears. 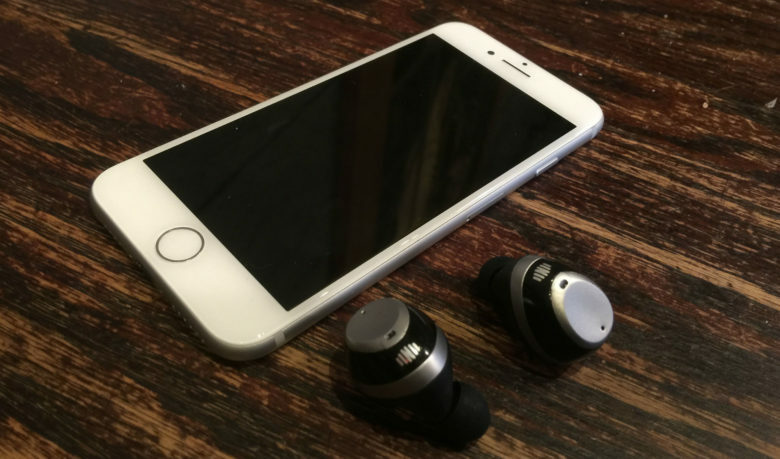 Apple’s termination of the headphone jack in the iPhone 7 launched the world into the “wireless future,” and IQbuds are here to let us hear what’s going on around us. Traditionally, innovation in the audio and hearing fields came from two distinct directions, Cannington said. High-end headphone makers focused on quality audio and the aforementioned noise-cancellation technology, while hearing aid makers brought out the big guns in the areas of miniaturization and amplification. 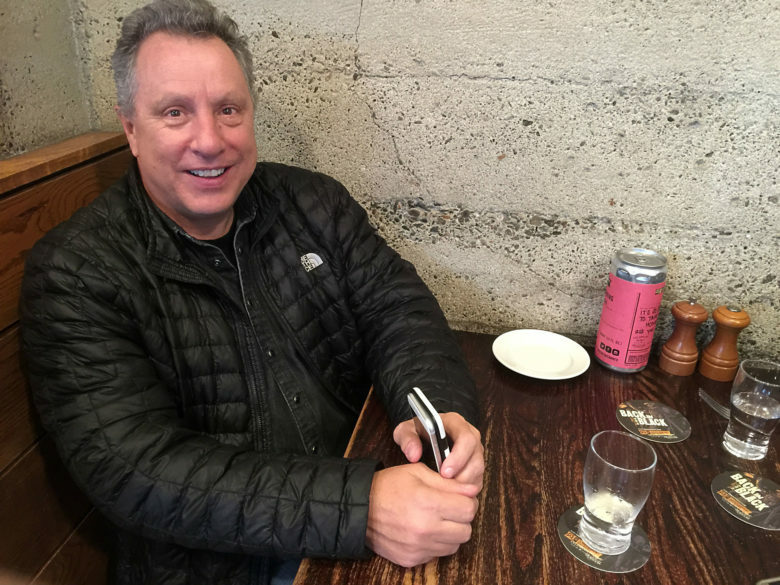 Nuheara found a sweet spot between the two, Cannington said over fish at chips at a noisy San Francisco brewpub. IQbuds’ “smart amplification” gives the wearer control, via iOS or Android apps, over how they hear the world around them. That means, for instance, that you can blend outside sounds with the music you’re listening to as you ride your bike to work — allowing you to hear the bus barreling down on you from behind — or elevate speech while dialing down the deafening roar in a club so you can carry on a conversation without shouting. Presets for certain situations and IQ settings are easily controlled by the app or by lightly tapping on an IQbud in your ear. “We purposefully make it as simple as you want it,” Cannington said. Cannington, who previously worked for Sensear, a maker of industrial headsets that let workers communicate in loud environments, said Nuheara had to harness a lot of technologies to build IQbuds. Nuheara’s technology team in Australia — the land of cochlear implants — employs engineers (including seven Ph.D.s) who specialize in RF frequency, software, hardware, industrial design, audio technology and speech processing. Each IQbud contains three boards, three microprocessors, two microphones, one speaker, a tap-touch control and two antennas — not to mention a battery that takes up “about 50 percent of the real estate,” Cannington said. Nuheara says you’ll get four hours of battery life for Bluetooth audio streaming or eight hours of hearing processing using SINC (Nuheara’s Super Intelligent Noise Cancellation) technology. Bluetooth beams audio from your device to one IQbud, and near-field magnetic induction gets the audio from that IQbud to the other. Like AirPods, IQbuds come with a charging case. It will juice up the earbuds three more times (it takes an hour or so for IQbuds to charge from the case, and two hours for the case to charge when plugged in). Unlike AirPods (but like many other wireless earbuds), IQbuds come with a variety of tips so you can fit them individually to your ears. The IQbuds completely fill the ear’s entrance, with a design similar to competitors like Alpha’s Skybuds or Doppler Labs’ Here One. IQbuds’ black charging case won’t be mistaken for dental floss. So, how do they sound? 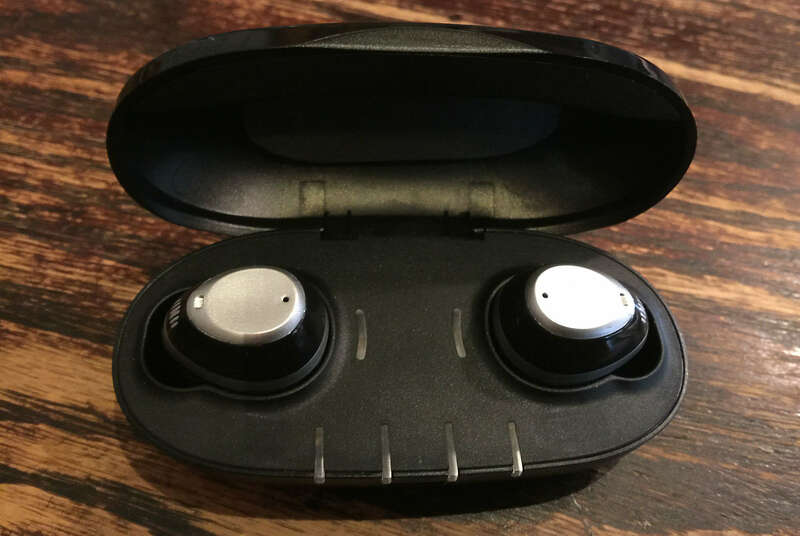 Cannington brought a pair of IQbuds hot off the production line’s first run. Popping them into my ears couldn’t have been simpler. After a quick insertion, a quick downward twist secured them snugly in my ears. Cannington walked me through how the earbuds work, demonstrating various settings in Nuheara’s app, which was still under development at the time. The experience was pretty amazing. Listening to music streaming from his iPhone sounded great despite the ambient noise in the busy restaurant. The audio was vibrant and punchy. The sound quality of the speech was not 100 percent natural, but it was at least as good as hearing aids I have tested that cost 10 times as much. Being able listen to a song, then hear a waitress’ question cut through the track (as well as all the background noise), was pretty magical. Plus, IQbuds’ seemed super-comfortable during the half-hour demo. They fit snugly in the ear and, for me at least, did not feel at all susceptible to dropping out. When I took them out, I was slightly shocked at how loud the ambient noise in the room was. Cannington and I had been communicating effortlessly just a moment before, and suddenly hearing and understanding each other became a bit more strained. And how do they look compared to Apple’s strange AirPods? Unlike hearing aids, which for decades have been crafted to be as unnoticeable as possible, IQbuds don’t make a play for invisibility. They fill up your entire ear, and look like … wireless earbuds. Currently, IQbuds only come in black with a silver center. That’s maybe not the most exciting color combo, but it looks fine (and better colors might be in the cards). The point is that, unlike hearing aids, IQbuds are not something you’re trying to hide –- these are normal-looking earbuds that nobody would feel weird wearing, especially now that we’re all getting accustomed to AirPods and other truly wireless earphones. Is the world really ready for hipster hearing aids? IQbuds’ adjustable noise cancelation lets you hear as much, or as little, of your surroundings as you’d like. There’s a definite untapped market. Nuheara discovered this during its wildly successful Indiegogo campaign last summer. The company raised nearly $800,000, and the majority of its backers were men between the ages of 35 and 60. They invested in IQbuds for two main reasons, Cannington said: They wanted earbuds with a truly wireless form factor, and they wanted to hear conversations in noisy bars. In addition to guys of a certain age who wouldn’t be caught dead wearing hearing aids, IQbuds have proven useful for people with certain concentration disorders like autism, according to Cannington. “Background noise is detrimental to being able to process what they need to process,” he said. There’s also a bill, The Over-the-Counter Hearing Aid Act of 2016 (.pdf), working its way through Congress to make it easier for people to buy low-cost hearing ads. The bill’s sponsors liken over-the-counter hearing aids to inexpensive reading glasses anyone can pick up at Walgreens for $20 or less. While some audiologists argue against the move, others think that loosening restrictions on OTC hearing aids will spur innovation, lower prices and lead to more people getting the help they need. Among other things, this means companies like Nuheara can now pitch their products as potentially helpful for people with a little bit of hearing loss. 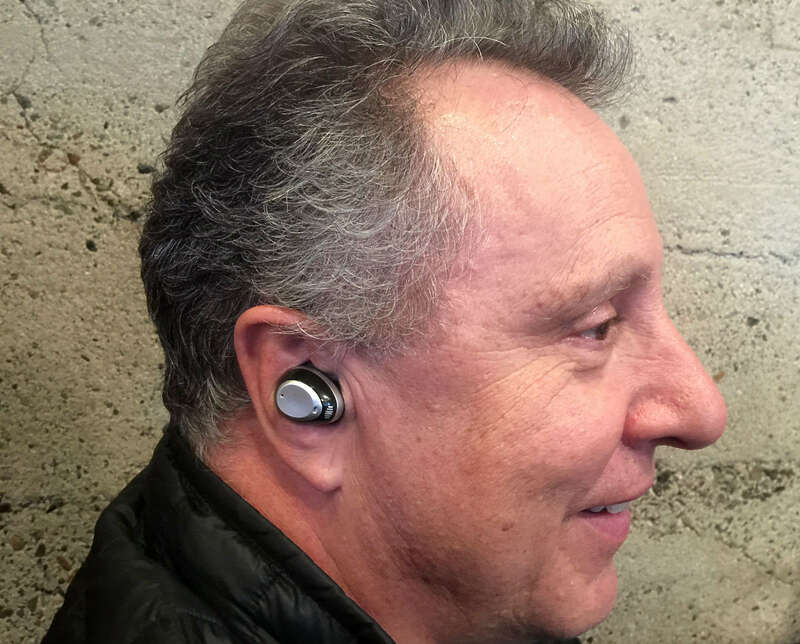 While this new world of hearables probably sounds like a nightmare to hearing aid companies, which traditionally have charged thousands of dollars for their products, it sounds like a happily disruptive future to Nuheara.